DejaOffice 1.12 beta brought a big new feature to our Android app: time zone support. That’s not the only big news, however. We’ve also introduced a feature that many of you have been asking for recently: the ability to copy and paste events in DejaCalendar. Copying and pasting events works just like you’d expect. In the day view or week view, just tap and hold (long press) on an event to bring up the context menu. Then, select “Copy” or “Cut.” Next, navigate to the day/week you want to move it to, tap and hold in a blank calendar space near the time you want, and select “Paste” from the context menu. It’s that easy! Can’t wait to try this out? 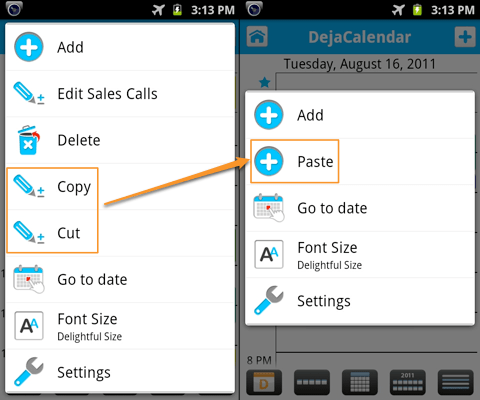 Head over to the DejaOffice website to download the latest Android beta. Have any other ideas for us on how to make DejaOffice better? Let us know! This entry was posted in Announcements and tagged android, beta, calendar, copy, dejacalendar, dejaoffice, events, paste, productivity by David. Bookmark the permalink. Kudos on the Time Zone support!!! I was having issues with my apps due to a VZW update, so I reloaded my DJO with the latest 1.12 Beta. I was VERY happy to see the Time Zone support. I think that it’s the way 95% of your users probably enter their data.